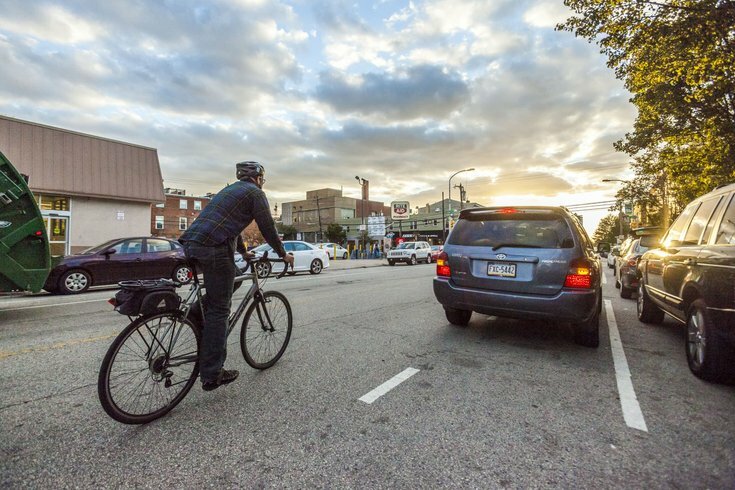 As Bike to Work week kicked off Monday, PennDOT announced it will expand an initiative to include work in its projects to widen shoulders where appropriate in an effort to make bicycling safer. The agency also said it would commence a pilot project to build and maintain several "demonstration bike lanes projects" in the five-county Philadelphia region to assess their long-term maintenance costs. PennDOT also said it was making it easier for local governments to construct bicycle lanes. The agency is scrapping a requirement for a formal agreement between PennDOT and municipalities proposing bike lanes. Now, only a letter of request with the information necessary for the request to be evaluated is needed. After a review, a letter of approval will be issued by the department. "We want to establish and update goals, objectives, and performance measures while offering guidance to local planning partners in setting priorities and developing bicycle and pedestrian plans," said PennDOT Secretary Leslie S. Richards in a statement. "Our overall goal is to integrate pedestrian and bicycle activities into our transportation network rather than have them be an afterthought." One local legislator was on board with PennDOT's efforts to promote bicycling as a transportation option. "Pennsylvania is smart to invest more in multimodal projects—like trails, bike lanes, sidewalks, and walking paths—to promote energy efficient and eco-friendly means of transportation," said state Rep. Madeleine Dean of Abington, Montgomery County, in a statement. "Providing healthier transportation options will help increase Pennsylvanian's quality of life by creating more active, livable, and forward-thinking communities." The announcement was made as part of a bike ride on Monday in Harrisburg by Gov. Tom Wolf, several cabinet members, other officials, and administration staff to mark the beginning of Bike to Work week.